Starting tomorrow, I am going through a full 10-day organic, cold-pressed juice cleanse provided by Gratijuice, The Juice Standard, located in Las Vegas, NV. Follow me on this 10 day journey as I will be providing detailed info about my cleanse including how I feel, pounds lost, energy levels, emotional state, side effects, health benefits, and full disclosure about what I’m going through. For the cleanse, I went with The Juice Standard, as I believe it is the leading cold-pressed juice company in the area. The owners Jamie Stephenson and Marcella Melnichuk have been so sweet in providing me with this 10-day cleanse as well as valuable info about cold-pressed juice and their company. 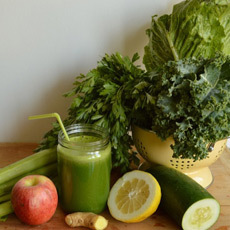 I feel so lucky to be able to be going through this detoxifying juice fast (as cold-pressed juice can be pricey, but well worth it – I believe). As many of you know I am a mother of 4 (ages 7, 5, 3, and 13 months). My four children have been the biggest blessings in my life (but, being a mom hasn’t come without challenges!) All four of them were poor sleepers within the first 2 years of their life (which means that I literally have not slept throughout the night in 7 years). I sometimes feel a bit depleted, yet I do have surprising amount of energy (which I mainly attribute to my healthy lifestyle, balanced diet, meditation and yoga practice). I don’t have any real expectations for this cleanse. I really just wanted to share my experience! So, here’s the skinny… the Standard Cleanse comes with a daily supply of eight, 12-ounce juices which vary in ingredients (fruit, veggie, and nut mylks). The 8 bottles are meant to carry you throughout the day to avoid hunger. They are labeled in a particular order to balance blood sugar and provide energy etc. I will tell you the exact ingredients when I get them tomorrow. My super hubby is going to be joining me in the cleanse and I will let you know how he progresses as well.